During my early years of software development I used to think of Code Reviews as a necessary bureaucratic monster, process designed to stop me from delivering the value and focus on pointing out mistakes. 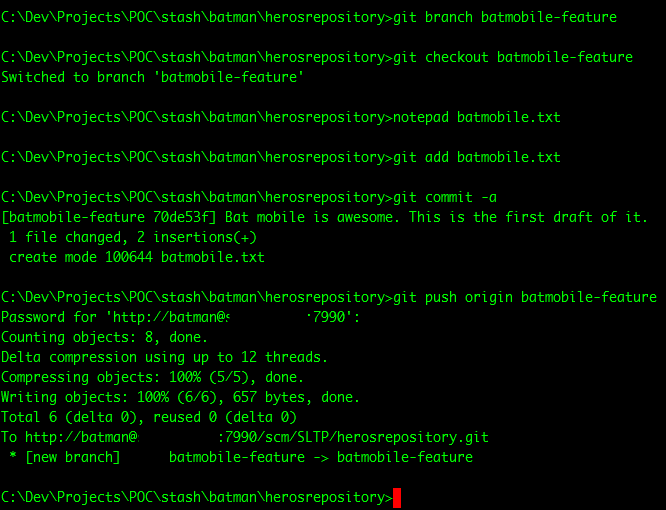 At RBS we are using Subversion and GIT as our SVC tools. We are using Stash to manage our repositories. Stash has a very useful features that could help setup the code review as a mandatory process, before the code is merged into the main branch. In this post I would like to show you how to set it up and how to use it. The use case for the Mandatory code review is taken from a real case brought at my work by one of the teams. The team was typical, Technical Lead, Senior Devs and Junior Devs. They wanted to leverage the Code Review goodness for learning. 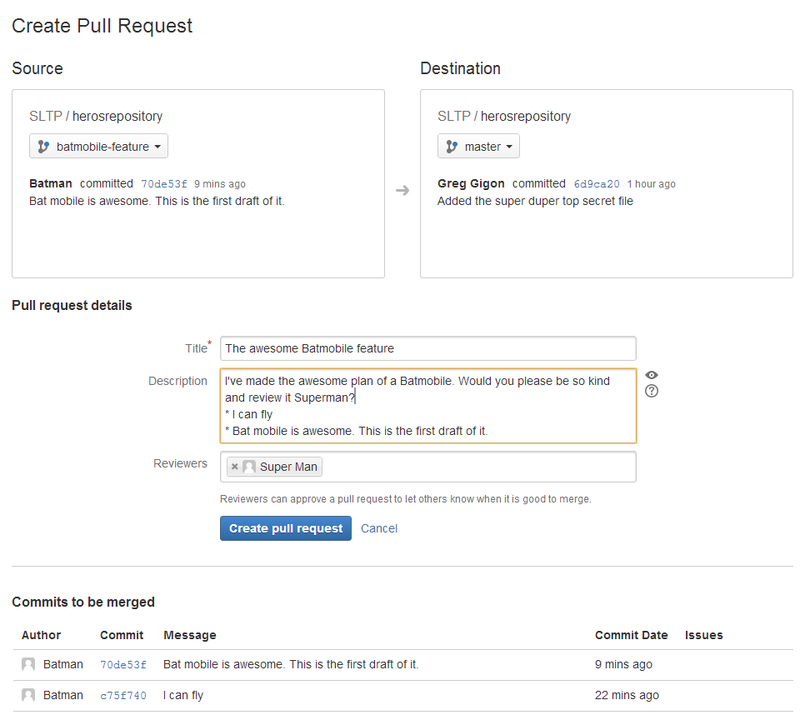 You might notice similarity in that process to the one that is quite common in the Open Source community and was championed by GitHub, called Pull-Request (on a side note, this site is great EpicPullRequests). First thing to do would be to make sure that all the people in your team are Contributors to a project. I have a group of users in Stash called superheroes. I need to set them as a Contributors on my project. What I’ve done above means that everyone superhero in the group would be able to contribute to the project. 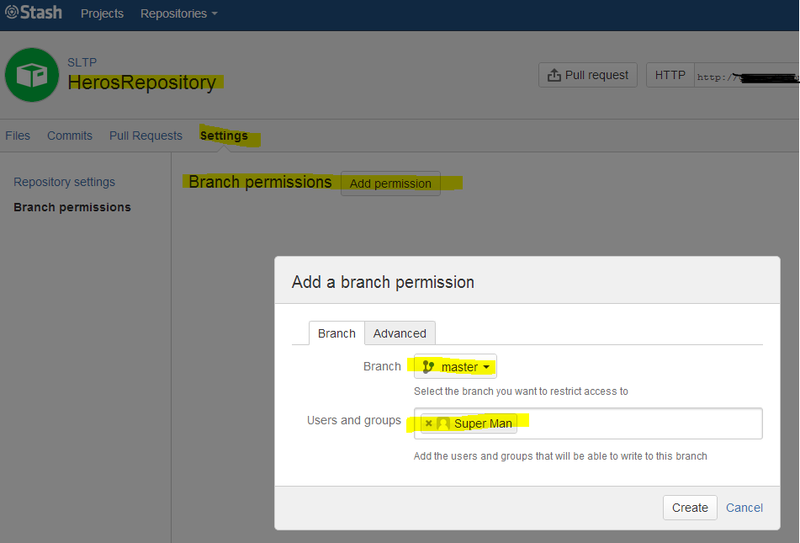 The next step will restrict the changes on Master branch and allow it only for a specific user (in our case, Superman). The above action will result in only Superman being able to make any changes on Master. 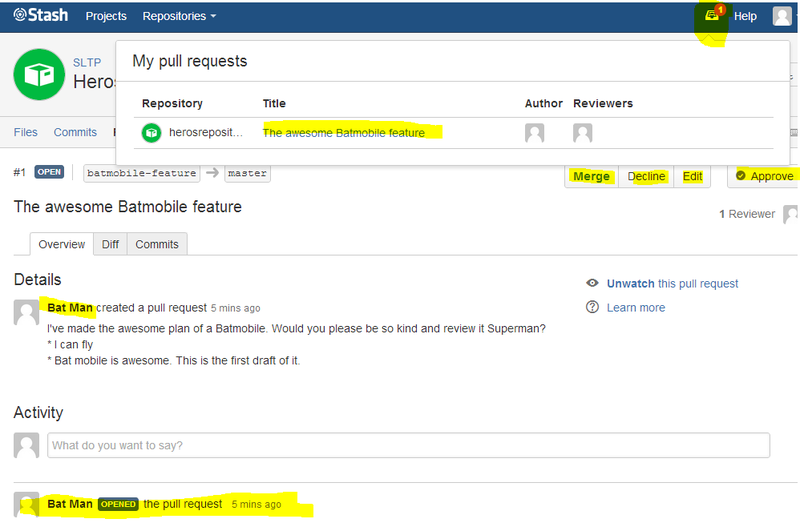 For Batman (the user that is restricted on Master but allowed on Project level) to be able to work he needs to work on a branch, push that branch into Stash and create a merge request (Pull request). When Batman finished working on the feature he would like to Batmobile to become mainstream and be adopted by all Superheroes. What he needs to do is to merge hist feature into the Master branch. We know already that he cannot do it as someone need to review his changes. In our case it’s the Superman. Batman creates a Pull Request. 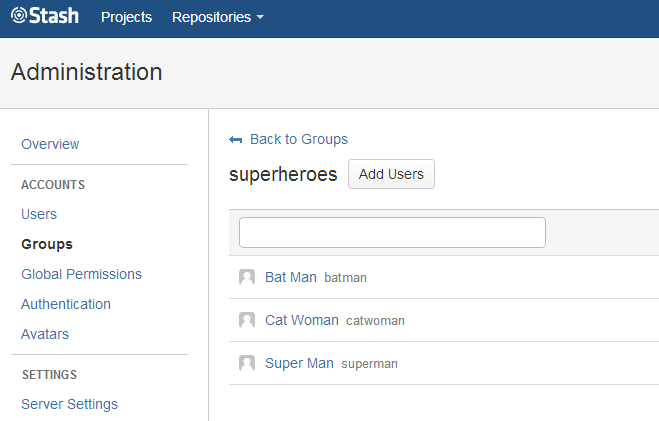 What Superman will see once he is logged into Stash he can review the Pull Request, approve them, decline, comment, etc. Once the request is approved, Superman or anyone else with the permissions to modify Master can merge it. Possibly worth to mention the fact that it is possible for anyone to review the changes as it is possible for Batman to request anyone to be the reviewer, however, only the users with enough privileges will be able to merge the changes. 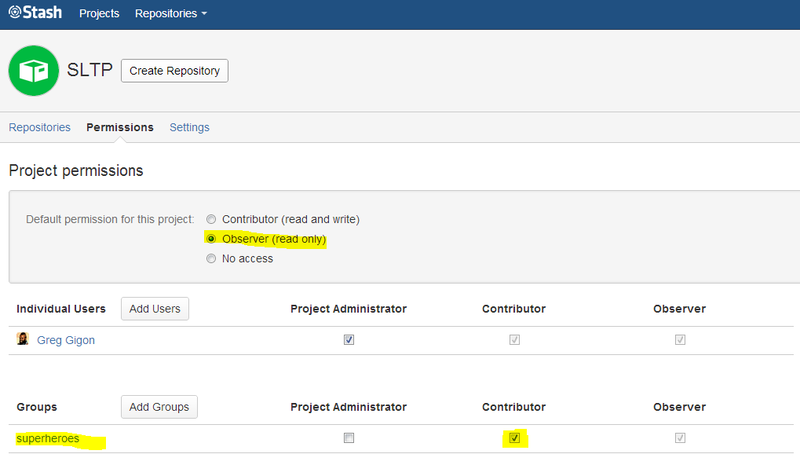 The above setup leverages the feature of Branch Permissions in Stash. Anyone who would like for changes to be merged into the Master branch will need to go through Code Review. Wishing you many happy reviews and much more learning. 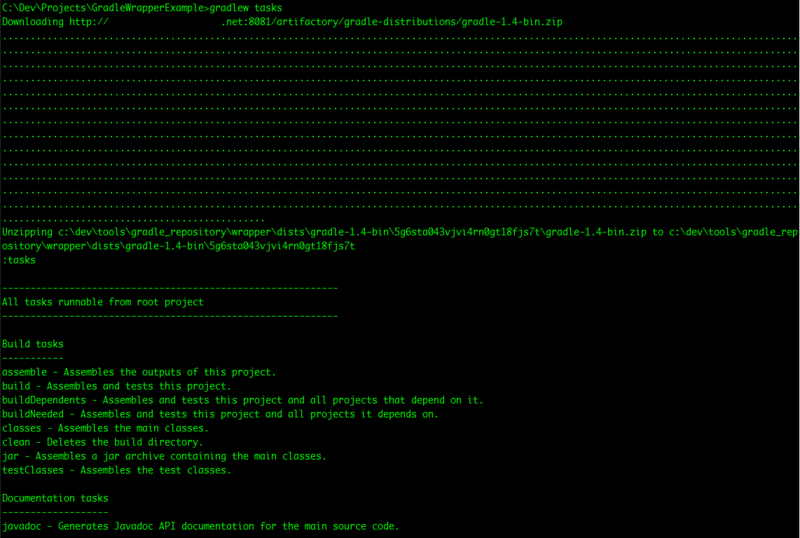 Gradle is a great tool for building projects. I’m using it to build Java and Groovy modules. TeamCity is a Continuous Integration server that many teams are using in RBS. We have a rather large farm of build agents. Some of them are specifically build to suit various build requirements (for example OS, or Browser version). However, majority of the Agents are generic and could be used by any build and project. By default we don’t have Gradle distribution installed on those TeamCity agents. TeamCity doesn’t come with bundled version of Gradle either. We could install versions of Gradle on the Agents, however it’s impractical due to the number of the Agents and the fact that there is many distributions of Gradle that could be required. Solution to that problem could be Gradle Wrapper. 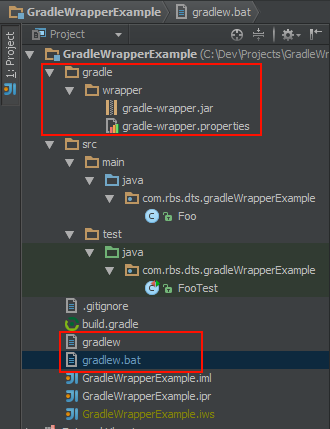 Gradle Wrapper contains few files that you should include as a part of your project. In this article I will introduce Gradle Wrapper, how to use it and how to set it up in TeamCity so it works behind firewall/proxy in enterprise network. 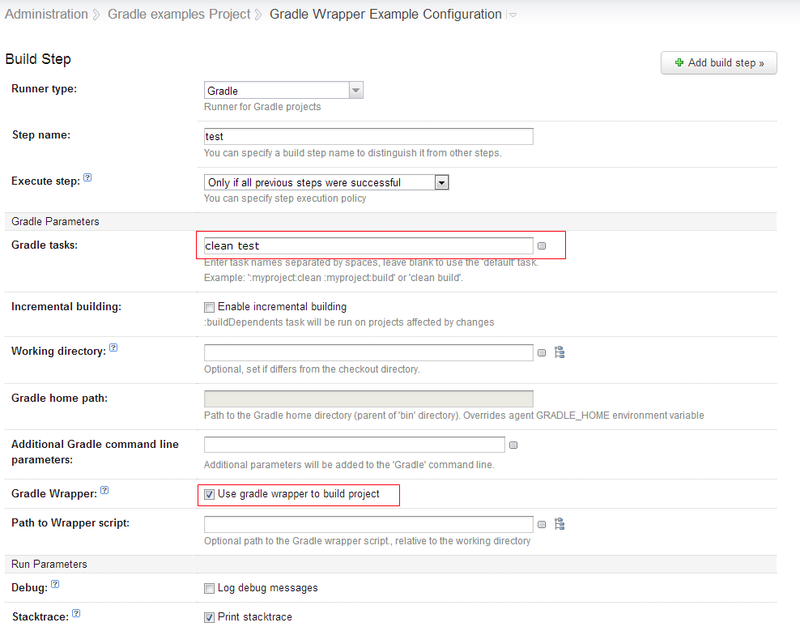 The main role of wrapper is to Download distribution of Gradle and execute the build independently of the platform. The interesting bit is that you can use Gradle to generate those files. The Gradle Wrapper files could be copied from another project or generated using Gradle Wrapper task. The task will generate folders and files that could be seen in the top picture of this post. You should be able to use Gradle Wrapper in the same way you use Gradle from your command line. Using Gradle wrapper script to list the tasks. When you execute the Wrapper for the first time it will download the distribution first (just as you can see on the picture above). You could face first problem if you are inside a corporate network, behind a firewall and proxy. To provide alternative Gradle Distribution URL you can set it up before you generate Gradle Wrapper files in your task of the build.gradle file. Or alternatively you can modify the gradle/wrapper/gradle-wrapper.properties file. The benefits of first approach is that you don’t need to host Gradle distribution anywhere within your network. The minus is when proxy requires authentication, you will need to put credentials in the file. The benefits of a second approach is that you don’t need to modify gradlew script files and you don’t need to provide proxy user credentials. Also, distribution is hosted internally which potentially could mean faster downloads. The downside is the fact that you need to host it somewhere internally accessible via HTTP protocol. The task is relatively simple with only one hurdle to overcome. Once the Gradle Wrapped downloads the Gradle distribution, where does it actually put it, and where will the dependencies downloaded during build phase go. 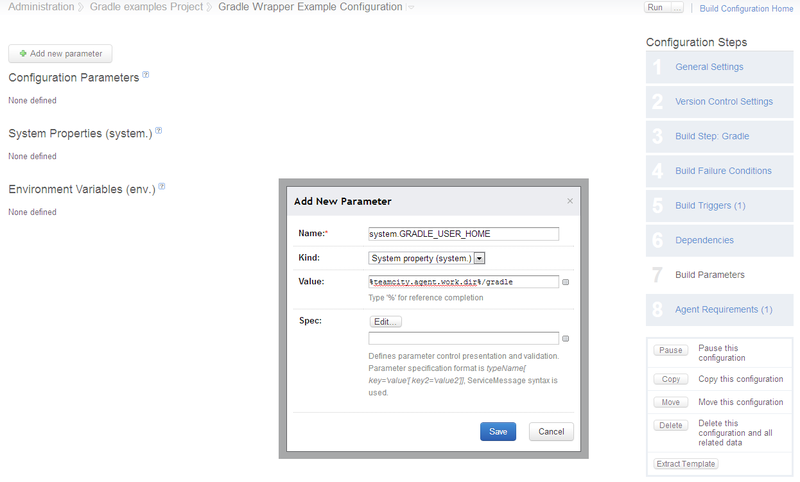 The gradle/wrapper/gradle-wrapper.properties file could be modified directly or setup during the prepareWrapper phase. Benefits of this approach is that you don’t have to configure anything specific in TeamCity. The downside is that you need to know in your script the details of Agent file system. The system property to set should be the one referenced by gradle-wrapper.properties which is GRADLE_USER_HOME. At this point it is important to mention one thing: if the same GRADLE_USER_HOME is used within different builds, it could potentially save time on downloading Gradle distribution and build dependencies. I wish you many happy builds.